AdderView DDX is a new breed of high performance KVM matrix that provides powerful functionality inside a small, compact form factor. 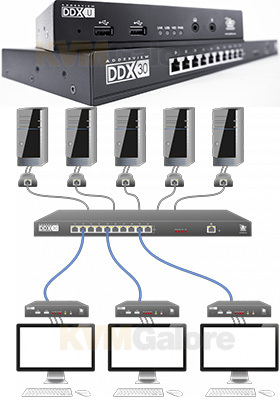 Featuring Adder's trusted lossless KVM extension technology with flexi-port switching capability, DDX system enables multiple users to access multiple computers located safely and securely inside your server room. An integral part of DDX system is the DDX matrix switch, a browser-based configuration and management tool that allows one or more remote admin user(s) to monitor and maintain all aspects of operation.